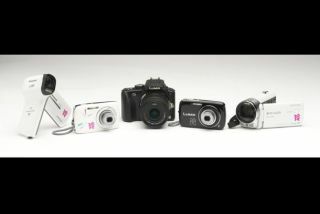 Panasonic has revealed a range of special and limited editiion collectables branded with the London 2012 logo, including cameras and camcorders. Custom designed versions of the Lumix G3, the latest compact system camera from Panasonic, and a branded version of the SD90 HD camcorder make up the limited edition range. Panasonic has manufactured only 2,012 of each model, with each packaged with a commemorative one-year-to-go £5 from the Royal Mint and new London 2012 packaging. The G3 is available in black and features a subtle gold London 2012 logo on the back and London 2012 close-down screen. Also available are the Lumix DMC-S3 digital camera, HX-DC1 upright HD camcorder and a range of headphones and SD memory cards. The special edition DMC-S3 will be available in white and feature a vibrant pink and green London 2012 logo and black with a subtle silver logo, both with London 2012 close down screens. Four special edition gold 4GB, 8GB, 16GB and 32GB SD cards form a collectable set, each featuring the Official London 2012 Olympic Games mascot, Wenlock, participating in various Olympic events. For more information, visit the Panasonic website.